Our indebtedness to our parents is so immense that it is not possible to repay it fully. 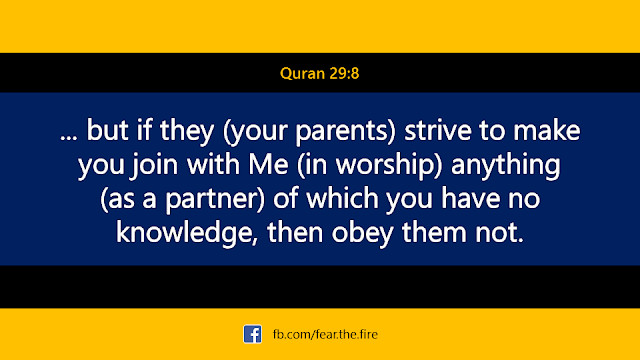 In lieu of this, it is obligatory for us to show the utmost kindness, respect, and obedience to our parents. 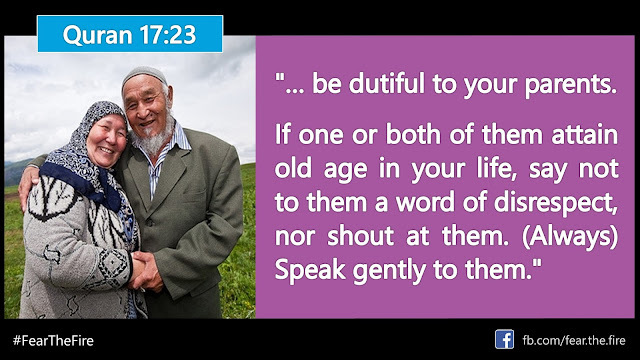 The position of parents, and the mutual obligations and responsibilities, have been addressed in Islam in great detail. The Quranic commandments, as well as the sayings of The Prophet (pbuh) guide us in this matter. The parent-child code of behavior in Islam is unique, since rules were laid down by divine command. 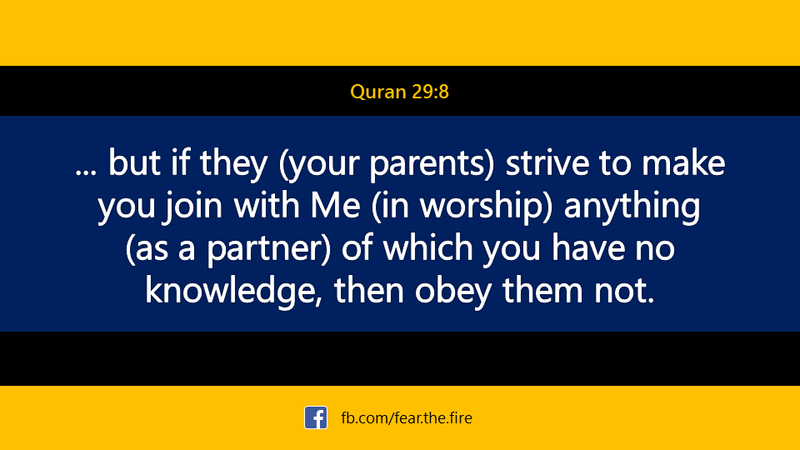 According to the above verse, gratitude to Allah and to parents go hand in hand. Gratitude to Allah is incomplete without showing gratitude to one’s parents. 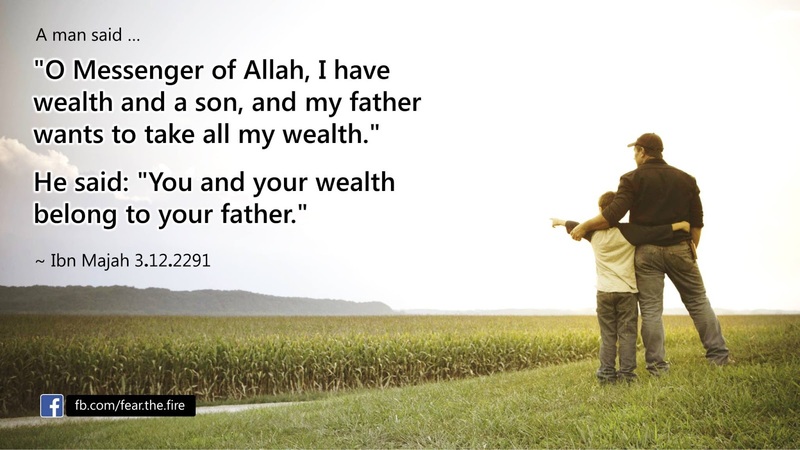 Since being grateful to Allah is a form of ibadah (worship) which earns heavenly rewards, it can therefore be said that being grateful to one’s parents also earns heavenly rewards. 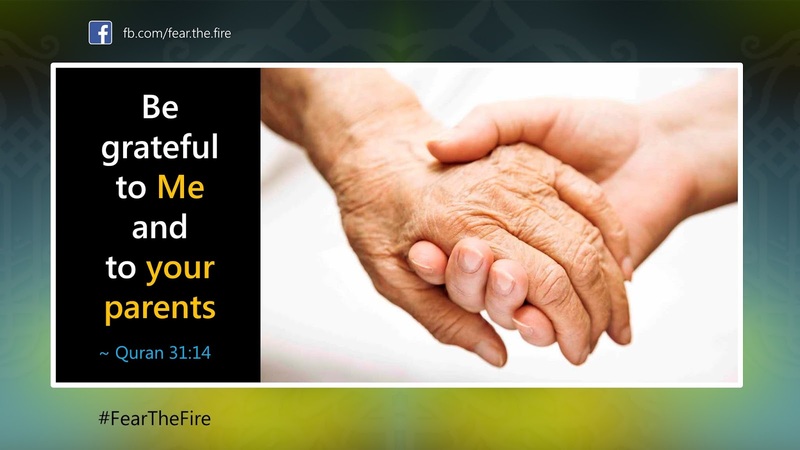 "Verily, Jibreel came to me and he said: Whoever sees his parents in their old age, one or both of them, and he does not honor them and he dies, then he will enter Hellfire and Allah will cast him far away, so say ameen." To that I said 'Ameen'. Abu Hurairah, one of the close companions of The Prophet (pbuh), always encouraged other people to be kind and good to their parents. One day he saw two men walking together and inquired of the younger one, “Who is this man to you?” to which the young man replied, “He is my father”. Abu Hurairah advised him by saying, “Do not call him by his name, do not walk in front of him, and do not sit before your father does”. If he has wealth, and his parents were in debt, he can discharge their duty by paying off the debt for them. 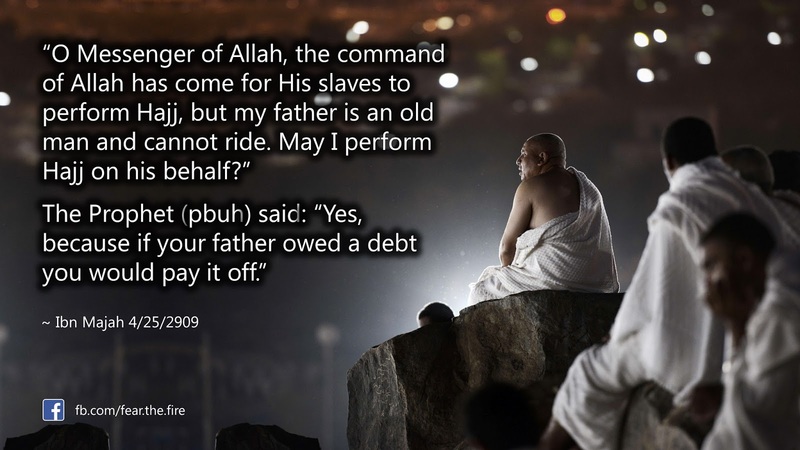 If he has wealth and his parents had not performed Hajj, he may perform Hajj on their behalf, or pay for someone else to perform Hajj on their behalf. More on Hajj here. 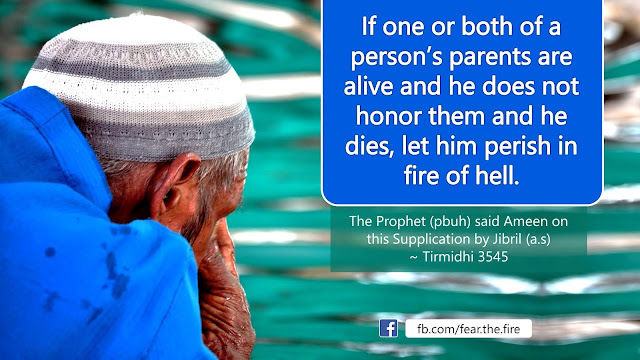 We should pray for our parent's mercy when they are alive and after they die. "My mother came to visit me when she was still a polytheist and she was living amongst Quraish. She was desirous, meaning in need, so I asked the Prophet (pbuh) and said: "O Prophet of Allah my mother came to me and she is a polytheist and she needs help. Should I keep a good relationship with her?" One of the individual obligations upon every accountable individual is honouring his parents irrespective they are Muslims or not. Thus imperative for a Muslim to treat their parents kindly so long as they do not coerce their believing child to perform Shirk. >> Click here to know more about how non-Muslims were treated in Islamic history. There are several other narrations that describes the status of parents in Islam but for the sake of brevity, we will limit to the above Quranic verses and hadith for now. 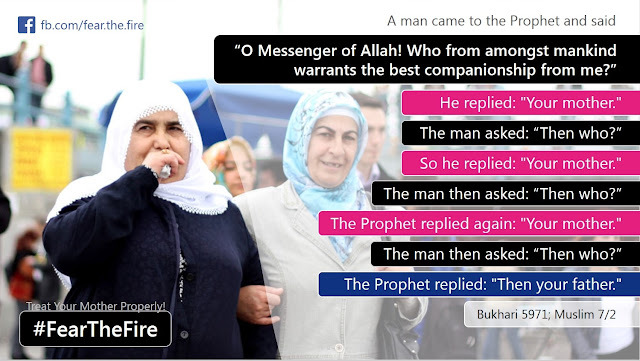 Women in Islam - the wife, mother, sister, daughter, widow, orphan etc.